some may be LOVE, MURRAY, FLINN and others. Marion County was formed in 1822. It is named for Francis Marion, a Brigadier General from South Carolina in the American Revolutionary War. 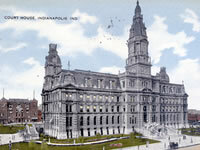 The State capitol was moved to Marion County in 1824 beginning with a period of rapid growth in population.